Saddle up for an adventure through the Alaskan wilderness! Your guided tour begins at the stables located next to the Mt. McKinley Princess Wilderness Lodge. Meet your experienced and professional horse wranglers as they will introduce you to the friendly, well-trained horses. As you ride out, take a deep breath, relax and marvel at some of the world’s most breathtaking scenery. While leisurely riding in the shadow of Denali (formerly Mt. McKinley), be sure to have your camera ready. Your guides will lead you through mountain paths surrounded by tundra, mosses and ferns with over 450 species of flowering plants which dominate the landscape. This tour takes place in Denali State Park—home to a variety of birds and mammals. Minimum age is 7. Maximum weight is 250 lbs. Wildlife sightings are likely but not guaranteed. Outback coats and riding helmets for young riders will be provided. Tour will operate rain or shine. Tour operates subject to meeting a minimum number of participants. 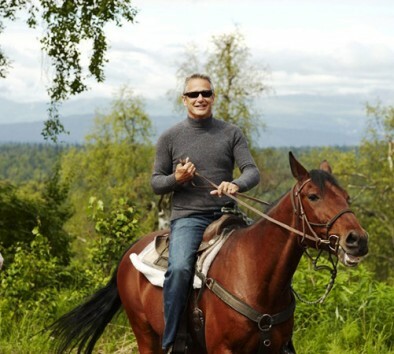 Time on horse ride is approximately 1½ hours.